As we’re about to launch headlong into a month of Inti Creates sidescrollers for February’s Cover Game(s) features, what better waifu to pick for this week than someone who is rapidly becoming the company’s mascot? 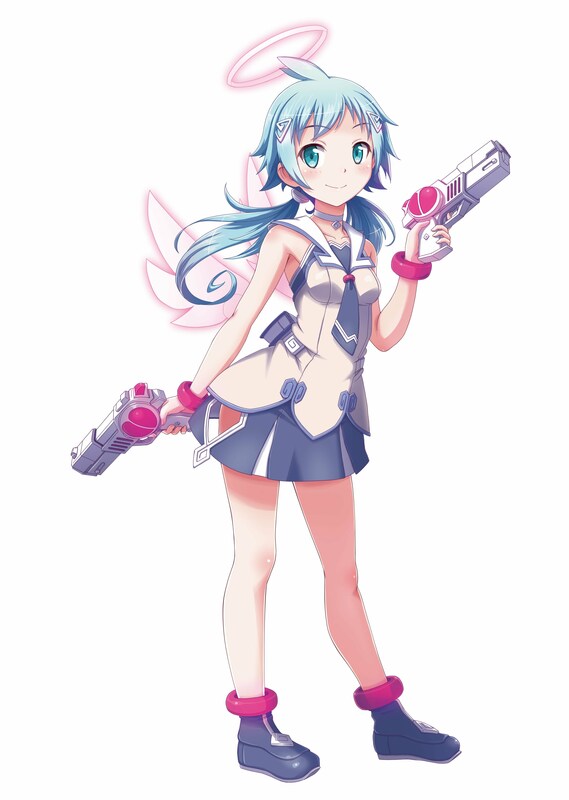 First introduced in 2015’s Gal*Gun Double Peace, Ekoro is a third-year student at the Angel Academy, and one of the catalysts for the events that unfold over the course of that game. Inadvertently causing protagonist Houdai to become irresistible to women by shooting him with an angel’s arrow 32 times more powerful than she intended, Ekoro spends most of Double Peace demonstrating that, just like anyone, angels are neither infallible nor squeaky clean at all times. Much of Ekoro’s appeal comes from this fallibility. While she does her best to present herself as a respectable and responsible young angel — she sticks by Houdai’s side in an attempt to help him find his true love by the end of the day, after all — there are frequent moments where her halo “slips” (metaphorically speaking) and she lets some rather more human characteristics come to the fore. In particular, at the outset of Double Peace’s story she harbours a certain amount of resentment towards young devil Kurona, the reason Ekoro messed up her shot in the first place. Her frustration with Kurona often manifests itself through Ekoro making some distinctly un-angelic comments about taking revenge, which Houdai is quick to pick up on. Not only that, but in an amusing example of “opposites attract”, a scene partway through the “Angel and Devil” route sees both Kurona and Ekoro finding that they have a certain amount of common ground between them — and, unfortunately for Houdai, that common ground is largely based on poking fun at his unfortunate self. 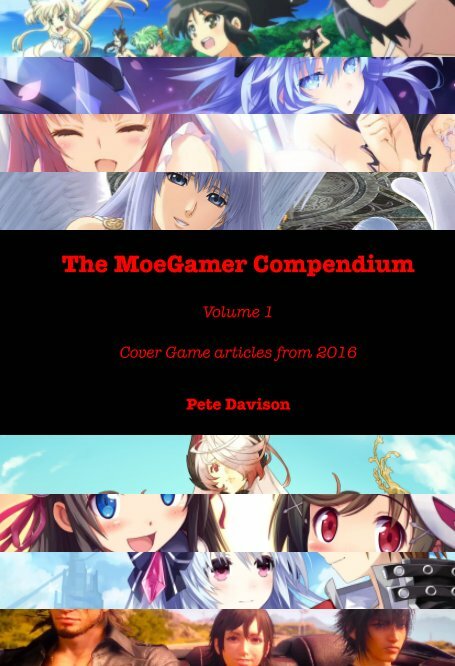 While you can, to a certain degree, play Houdai as you like through Double Peace using a combination of manipulating his statistics and making dialogue choices, he is mostly depicted as a reasonably responsible young man who wants to do the right thing rather than succumb to the hordes of lusty young women out for… well, not blood, let’s just leave it at that. Ekoro’s gentle ribbing of him as being “creepy” at times mirrors the broader attitudes towards — and misunderstanding of — popular media such as Gal*Gun, but that doesn’t stop her from encouraging him to get into awkward situations in the name of his mission for true love. There’s never the sense that Ekoro crosses that line into maliciousness, mind, either when she’s dealing with Houdai or talking about Kurona. Her frustration with Kurona is somewhat more akin to the irritation one might feel at times towards a younger sibling — Kurona is depicted as a rather younger-seeming girl than Ekoro — and the troubled relationship between the two explored over the course of the Angel and Devil route in the game is enjoyable to witness. In other Inti Creates games, Ekoro’s fallibility and imperfection is often depicted as her being somewhat clumsy and incompetent, which is in keeping with what is implied about her character over the course of Double Peace. She tends to mean well with what she does — and is under pressure from her family to do great things, which is why she is so keen to set her mistake with Houdai right — but often finds herself struggling with the execution. She sometimes even finds herself a little too invested in the situations in which she finds herself, as seen in her ending for Mighty Gunvolt Burst, in which she trashes the bedroom of a “young man” (strongly implied to be Houdai) after getting rather too wrapped up in the game she has been playing. 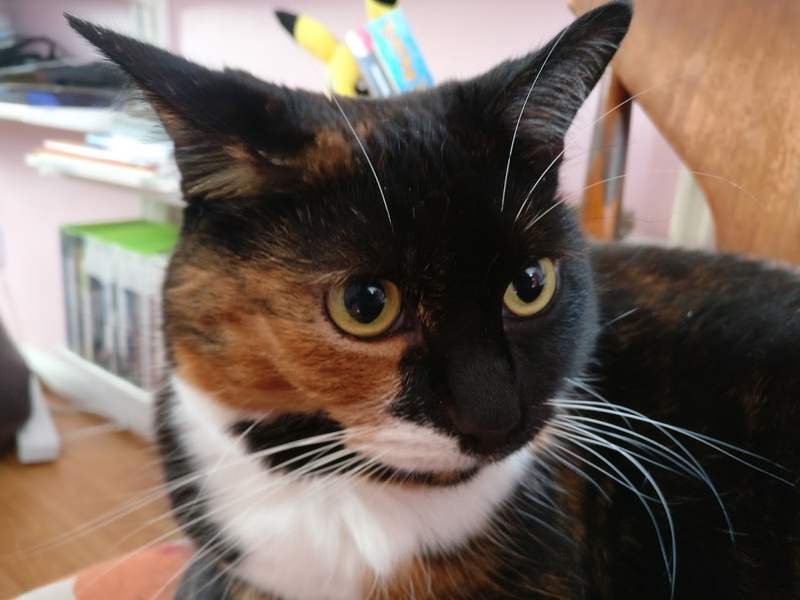 Above all, Ekoro is fiercely loyal and devoted to the people she cares about. It becomes clear as Double Peace progresses that she comes to genuinely care for Houdai, even in the routes that see him end up with someone else. She is invested in his happiness, and constantly pushes him forward in his quest for true love, not just because she feels guilty about her mistake and the potential consequences, but also because she wants him to be happy. 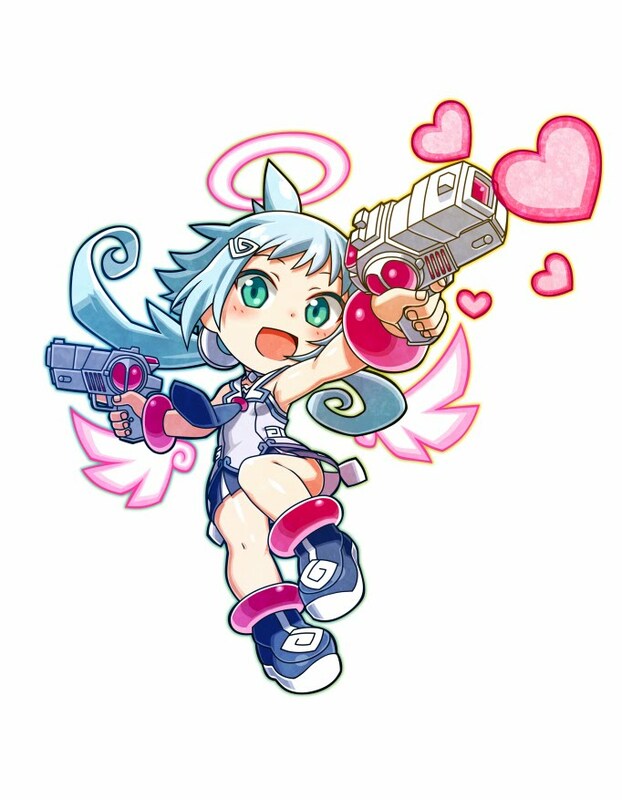 Her loyalties are a little divided, however; it transpires over the course of the Angel and Devil route of Double Peace in particular that she holds her senpai Patako — one of the stars of the original Gal*Gun, which never made it West — in very high esteem indeed. In fact, there’s the suggestion that her feelings may be rather more than the simple kouhai-senpai relationship; indeed, the final battle of her route is sparked entirely by her feeling jealousy over Houdai being apparently close to Patako in a way she has always wanted to be. It’s all a big misunderstanding, of course, but it makes Ekoro’s feelings for her senpai abundantly clear. As a character, Ekoro is a great deal of fun to spend time with, and her depiction through art and voice acting only enhances her appeal. Her portrayal by Yui Horie (who also voices Nepgear in the Neptunia series) in Double Peace fits her personality perfectly, combining a gentle femininity with a sense of being rather up-tight and highly strung a lot of the time. She’s one of those characters that it’s fun to hear get wound up and annoyed, because Horie’s voice is so sweet and gentle most of the time there’s an amusing, comic disconnect between the things she says and the tone in which she says them at times. Her huffiness at Houdai describing her angel’s arrow as “poison” is a particular highlight. She’s got a great deal of visual appeal, too. Her outfit is distinctive and iconic, and she eschews the common depictions of angels as either motherly or sexless figures. She’s girlish rather than womanly, and her hairstyle suggests that she has tomboyish tendencies but doesn’t completely want to give up her femininity — a fact confirmed in some of the narrative routes when Houdai discovers she’s part of the Angel Academy’s military club, hence her use of dual-wielded pistols rather than the more conventional bow to fire her arrows. From a more abstract design perspective, she has an immediately identifiable silhouette and clear colour scheme, which has made her eminently ideal for adaptation into the NES-inspired art style of Blaster Master Zero and the Mighty Gunvolt games, in which she appears as a guest character. This perhaps explains why she’s seen so frequently in games she technically has nothing to do with — either that or she’s the official waifu of someone high up at Inti Creates. She is my favorite girl of Double Peace. Always by your side, hardworking to be a good angel, to make up for her mistakes and to help the protagonist find true love. She’s a lovely for sure, and I’m glad she gets so much love in other games!